HANDS-FREE hANdS-FREE ELECTRONiC OpERATEd FAuCETS Bowl Size: 10” x 14” x 5” • Overall Size: 15 1/4” x 17 1/4” Includes K-175 AC/DC Powered Electronic Operated Faucet Han dW ash ing Sin ks     7-PS-51 $2253 Equal to 7-PS-50 with K-175 Faucet 21 lbs. 2 cu. ft. 20 gauge 7-PS-61 $2072 Equal to 7-PS-60 with K-175 Faucet 19 lbs. 2 cu. ft. 20 gauge 7-PS-81 $3101 Equal to 7-PS-80 with K-175 Faucet 32 lbs. 10 cu. ft. 20 gauge 7-PS-91 $2993 Equal to 7-PS-90 with K-175 Faucet 41 lbs. 10 cu. 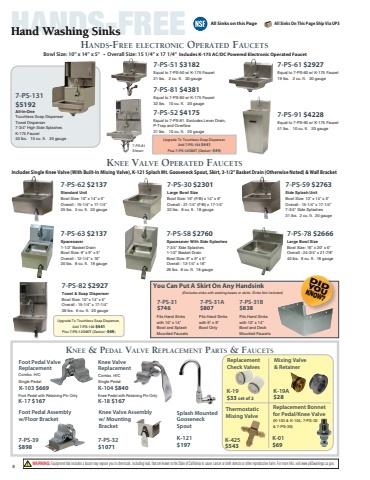 ft. 20 gauge kNEE vALvE OpERATEd FAuCETS Includes Single Knee Valve (With Built-In Mixing Valve), K-121 Splash Mt. Gooseneck Spout, Skirt, 3-1/2” Basket Drain (Otherwise Noted) & Wall Bracket    7-PS-30 $1629 Large Bowl Size Bowl Size: 16” (F/B) x 14” x 6” Overall : 21-1/4” (F/B) x 17-1/4” 33 lbs. 8 cu. ft. 18 gauge 7-PS-63 $1513 Spacesaver 1-1/2” Basket Drain Bowl Size: 9” x 9” x 5” Overall : 12-1/4” x 16” 20 lbs. 8 cu. ft. 18 gauge 7-PS-82 $2072 Towel & Soap Dispenser Bowl Size: 10” x 14” x 5” Overall : 15-1/4” x 17-1/4” 38 lbs. 6 cu. ft. 20 gauge 7-PS-62 $1513 Standard Unit Bowl Size: 10” x 14” x 5” Overall : 15-1/4” x 17-1/4” 25 lbs. 2 cu. ft. 20 gauge 7-PS-78 $1888 Large Bowl Size Bowl Size: 16” x 20” x 6” Overall : 24-3/4” x 21-7/8” 40 lbs. 8 cu. ft. 18 gauge 7-PS-59 $1956 Side Splash Unit Bowl Size: 10” x 14” x 5” Overall : 15-1/4” x 17-1/4” 7-3/4" Side Splashes 31 lbs. 2 cu. ft. 20 gauge All Sinks on this Page All Sinks On This Page Ship Via UPS        You Can Put A Skirt On Any Handsink (Excludes sinks with existing bases or skirts. Sinks Not Included) 7-PS-31 7-PS-31A 7-PS-31B $524 $544    8 $485  kNEE & pEdAL vALvE REpLACEmENT pARTS & FAuCETS    Foot Pedal Valve Replacement Combo. H/C Single Pedal K-103 $434 Foot Pedal with Retaining Pin Only K-17 $109 Foot Pedal Assembly w/Floor Bracket 7-PS-39 $583 Knee Valve Replacement Combo. H/C Single Pedal K-104 $546 Knee Pedal with Retaining Pin Only K-18 $109 Knee Valve Assembly w/ Mounting Gooseneck Bracket Spout Replacement Check Valves K-19 $22 set of 2 Thermostatic Mixing Valve K-425 $389 Mixing Valve & Retainer K-19A $17 Replacement Bonnet for Pedal/Knee Valve (K-103 & K-104, 7-PS-32 & 7-PS-39) K-01 $45       Splash Mounted     7-PS-32 K-121 $695 $128   WARNING: Equipment that includes a faucet may expose you to chemicals, including lead, that are known to the State of California to cause cancer or birth defects or other reproductive harm. For more Info.,visit www.p65warnings.ca.gov. DID YOU KNOW? Fits Hand Sinks with 10” x 14” Bowl and Splash Mounted Faucets Fits Hand Sinks with 9” x 9” Bowl Only Fits Hand Sinks with 10” x 14” Bowl and Deck Mounted Faucets     WARNING: Faucets on this page may expose you to chemicals, including lead, that are known to the State of California to cause cancer or birth defects or other reproductive harm. For more Info.,visit www.p65warnings.ca.gov.